"Discover How You Can Very Quickly And Astonishingly Easily Get Successful Websites To Reveal Their Most Private Business & Marketing Secrets To You..."
This may surprise you, but if you know where to look - you can discover some of the most private business secrets of many websites online. Even detailed data like exactly how much traffic the site is getting, and where it's coming from! What I'm referring to here is little known, but publicly available information that allows you to do very in depth research on almost any website you're interested in finding out more about. I use these research secrets myself often, and I've broken down these website research strategies into eighteen distinct tactics. I've put these tactics together into a series of coaching videos that show you how to quickly start using them. And very importantly - every one of these tactics is free to use. These eighteen videos come to a total playing time of almost two hours: one-hundred and fourteen (114) minutes in total. In this video you'll discover how to find out exactly who owns a website, and how long they've owned it for. Here I'll show you how to quickly and easily find how a website has changed over time. In this video I'll show you how to find exactly how many (and what kind of) pages make up a site. What you discover here is often very surprising. Here I'll show you how to find exactly who's linking to a website, and how to automatically track this information over time. In this video you'll discover how to find the Page Rank of any page - without - using the Google toolbar. Here I'll show you one of the most surprising and powerful pieces of information you'll ever come across - exactly how much traffic a website is getting, where that traffic is coming from, how long each visitor is staying on the site ... and much more. The depth of this publicly available information (if you know where to look) will really surprise you. In this video I'll show you how to find all the PDF documents on any website you choose. Here I'll show you a little known way to find out exactly which web host a competitor is using. In this video I'll show you how to use Alexa to find how much traffic a website is getting - and - very importantly, what you must keep in mind whenever you look at any Alexa statistics. Here I'll show you a publicly available database that can tell you exactly which kind of products are making the most money right now. In this video I'll show you how to find exactly what products your competition are selling on the popular Froogle search engine. Here I'll show you how websites can hide offers and information from you, and how to easily get around this so you can discover exactly what they're up to. In this video I'll show you a little known way to find out how popular a blog or newsletter is. Here I'll show you an easy way to list all the title text on a competitors website. In this video I'll show you how to easily create keyword lists (with the help of your competition) and how to expand them into thousands of terms quickly. Here I'll show a very quick and easy way to find which websites your competition own but are keeping private. In this video I use this tactic on Google.com with very surprising results. 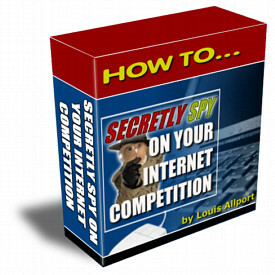 In this video I'll show you how to find out how much publicity your competitors are getting. Here I'll show you how to find exactly where in the world any IP (internet address) is from.